If someone was in charge of marketing 9 in the UK they should be taken out and shot. This was simply the most amazing, wonderful, visually stunning and thrilling movie of the year and even though I am happy to vote for �UP� as the best animation, this beats the pants off any adult action movie that you care to mention. It is simply awesome in the old fashioned sense. There are strong influences and you are channeling �The Third Man� set in the devastation of post-war Europe, and 'Delicatessan' � a post-nuclear devastated France. Yet these are curious battle scarred chain mail dolls you are worried about. Never mind a scientist breathing his soul into these dolls and giving them life, the director and writer have breathed soul and magic into a post-apocalyptic world and instead of Arnie going there to wreak destruction and mayhem, it is one curious doll number 9 who sets of a chain of events from the moment of his �birth�. That the scientist who created them had to die to give them life is a noble tragic touch and this film is no Pinocchio. It is not cute, but it is gripping, exciting, with a fantastic sound track from Danny Elfman. 9 voice by Elija Wood is the curious one, 1, voiced by Christopher Plummer the conservative Archbishop who hides out in the ruined Cathedral, 8 is voiced by John C Reilly and isn�t too bright but he is the protector, six voiced by Crispin Glover is the mad visionary, 5, voiced by Fred Tatsciore is the healer, 2 voiced by Martin Landau the frail one who seems to embody the scientist who gave them life and 7 voiced by Jennifer Connelly who is the brave one, the girl who is the smartest one of all. 3 and 4 are twins, the scholars who communicate with projected film. This film cost $30 million to make and was snuck out on one screen in the south of England without fanfare and yet it was truly fantastic. To be sure it might scare the pants off anyone under seven years of age, but the kids in the audience I was in survived and had the time of their lives. 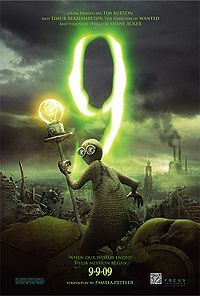 Save 9 from oblivion. Find it, buy the DVD or Download it. Adult or child it will be the most rewarding cinema experience of the year.